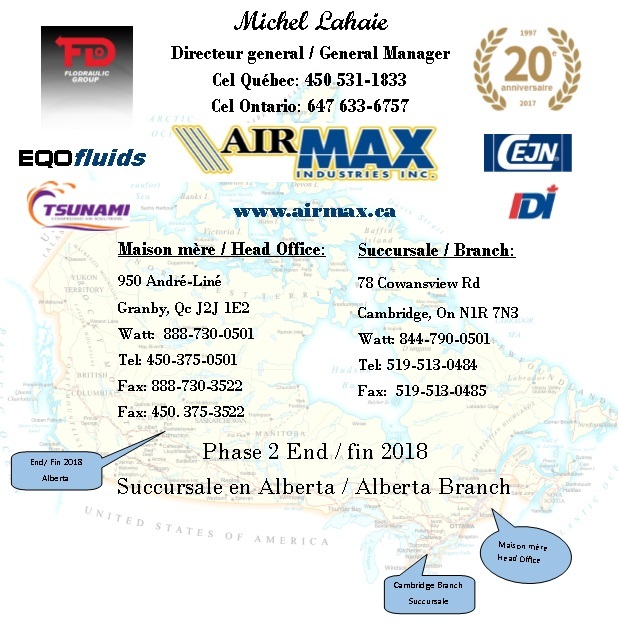 Eleven years of constant growth coupled with our continuous quest to search out and source innovative products has made AirMax the leading pneumatic expertise center in Canada. Our program aims to be the most complete pneumatic product selection in the country in order to offer our customers the benefits of having only one source for all of its needs. AirMax has established an enviable reputation as a J.I.T. (just in time) supplier to the national industrial market. In fact, over 95% of all products ordered ships the same day. AirMax is an exceptional team devoted to only one goal: customer satisfaction. AirMax is an array of top quality products of international reputation offered at very competitive prices. AirMax is part of the FloDraulic group of companies.